At the moment there are a number of bee-related apps out there (like this list), mainly concerned with monitoring the progress of hives, honey production and record keeping. There are other ways apps could make our lives as beekeepers easier – including helping people to find “feral” hives and looking out for disease information. I have put a few ideas about how spatial and mobile technology – things that we work in here at Gaia Resources – could be used to help hobbyist beekeepers like me. Let’s imagine a beautiful breezy spring, abundant in flowers. Every hive feels the urge to multiply and to produce a swarm to conquer the unknown. Mind you, a healthy (improperly managed) hive can produce 3 or more swarms per year. Those feral swarms seek tree hollows, Telstra boxes, compost bins, wall cavities and other uncanny nooks. They have been known to take habitat from native species and allegedly destroy nests and take up breeding space. After the swarm settles in a space, it becomes a “feral” hive. 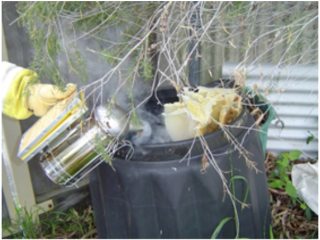 A surprise hive in your compost bin is not always welcome! It’s worth to mention here that Apis mellifera, the European Honey Bee, is a feral species that has no native place in the Western Australian ecosystems. It would be quite useful to have an app where a member of public, upon seeing a swarm or a hive, could take a few photos, answer a few questions about the type of the colony, general location, access and size and submit the data to the local government/approved beekeepers. These beekeepers can then take responsibility for the hive, it gets removed (or preferably, rehomed) and the job is closed in the app. This would be a really interesting app as it could really help with the management of these feral hives, and people who are interested in rehoming and looking after these hives would be happy to help! Australia is the last continent without the (well named) Varroa destructor mite, and WA is still free of the small hive beetle. An app that could detail the occurrence of pests, diseases and threats to bees can help policy makers and beekeepers to assess potential dangers to beekeeping (and general biosecurity) in an area. 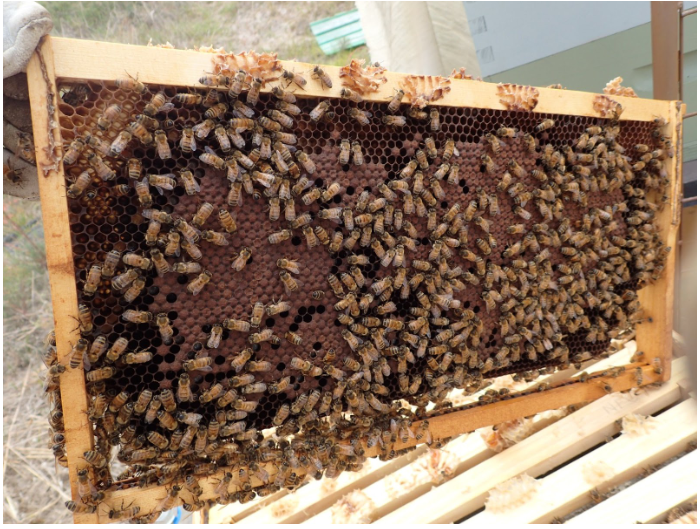 Vigilance is especially important close to ports, and this focus on biosecurity is one of the reasons why you can’t bring honey into Western Australia. The wider community of beekeepers, especially those that move their hives around (we call them migratory beekeepers), would benefit from an app that lets the beekeepers log occurrences of disease, mysterious hive demise (colony collapse disorder) and the spread of pests. A user could upload pictures and description that could be collated, or sent to the Department of Primary Industries and Regional Development (formerly the Department of Agriculture) for assessment, similar to how the Department currently manages sightings of pests using the My Pest Guide. The reporting is just one part of it though – this sort of information, if made available, could help to record colony collapses in specific areas so they could be assessed (e.g. was it caused by pesticides), could help to show the areas where American foulbrood (a bacteria that infects honey bee larvae) was identified and could possibly spread (e.g. a spatial 4km radius could be applied to the location) to show migratory beekeepers where to avoid. This could go a step further to alert other app users within that sort of radius about the particular pest in their vicinity. This one has the potential to be quite contentious – putting out information about disease can be problematic, but if we are to try to prevent the collapse of bees from ecosystems (yes, even the feral ones!) and all the terrible flow on effects that the loss of these important pollinators could cause, it seems to me to be worth a try, at least! If you know of other apps, or would like to know more about how we can help you with mobile app development, research programs, data management or spatial information systems, then please leave a comment below, start a chat with us via a Facebook, Twitter or LinkedIn, or email me directly via alex.chapman@gaiaresources.com.au. * Yes, we know there are apps out there with these sorts of names – and that these are really bad puns – but it helps describe the content, at least!